Press Release | Slip Resistant Footwear – Don’t Take The Fall! Slip Resistant Footwear – Don’t Take The Fall! It is perhaps not commonly known that Slip Resistant Footwear, regardless of whether or not it has toe protection is classed as an item of Personal Protective Equipment and as such must comply with the PPE directive 89/686/EEC. A claim of slip resistance on a footwear product classifies this as an item of PPE under the directive and these products require testing, CE marking and certification from a European Notified body laboratory before placing on the European market. 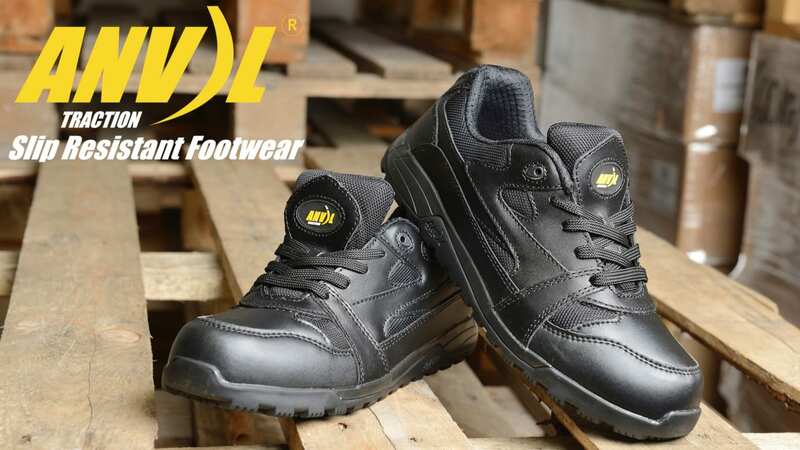 Anvil Traction, the UK market leader in slip resistant footwear has representation on the CEN TC161 & ISO TC94 Safety Standards Committee and is always fully aware and knowledgeable of the latest European and International standards. It is a commitment that they take very seriously which is reflected in the investment made in developing their own in-house testing facility which boasts an impressive array of testing options such as Impact Testing, Electrical resistance testing of antistatic and conductive footwear and DIN outsole abrasion resistance testing to name but a few. Lloyd Preston, Technical manager at Anvil Traction comments; “Any product designed to be worn or held to protect the wearer is classified as Personal Protective Equipment. These products are covered by the PPE directive 89/686/EEC and require testing and the application of the CE mark on the footwear itself”. He continues “A fact that is perhaps not quite so commonly known is where the responsibility falls for ensuring that PPE is appropriately labelled with the CE marking and that it holds the required certification. Many people would assume that this comes down to the manufacturer however legislation states that the responsibility falls squarely on the shoulders of the site manager, who needs to ensure that all PPE has the correct markings and certification appropriate to the risks identified”. It should come as no surprise that Anvil Traction, with their involvement and commitment to PPE legislation and certification ensure that all of their products hold the correct CE Markings and are fully compliant with the latest European Standards, giving site managers complete peace of mind that when they purchase from Anvil Traction they are completely compliant with the relevant EU legislation using the latest harmonized standards EN ISO 20345:2011 for safety footwear and EN ISO 20347:2012 for occupational footwear where there is no mechanical risks to the toes.